After many trials and tribulations, I have finally created a brownie recipe that is as delicious as it is healthful. It's made by soaking flour and oats to aid digestion and nutrient assimilation, but without the slightly sour taste that usually comes from soaking grain products. These brownies are similar to a dense cake, fudgy, and are delicious whether served warm or cold. Combine the oats and flour in a bowl, cover with water, and stir in the whey or buttermilk. Let stand covered at room temperature for several hours. In a separate bowl, whisk together the Rapadura and butter. Add eggs one at a time, whisking well after each addition. Whisk in the cocoa powder, vanilla, and salt. Drain the oats and then add to the cocoa mixture. Fold in chocolate chips. Pour the batter into a lightly greased 8"x8" pan. Bake at 350 for 30 minutes, or until a toothpick comes out clean. Enjoy! Here's an interesting piece for all you young, and not as young as you imagine, single males- the gamers, the self-deprecating narcisists, the Friends generation, and the anti-depressed alike... if you can hack reading a multi-paragraphed article. Tough love, Baby, tough love. On Friday, my parents and Sarah Grace took my grandmother to her 62nd high school class reunion in Hartsville, SC. 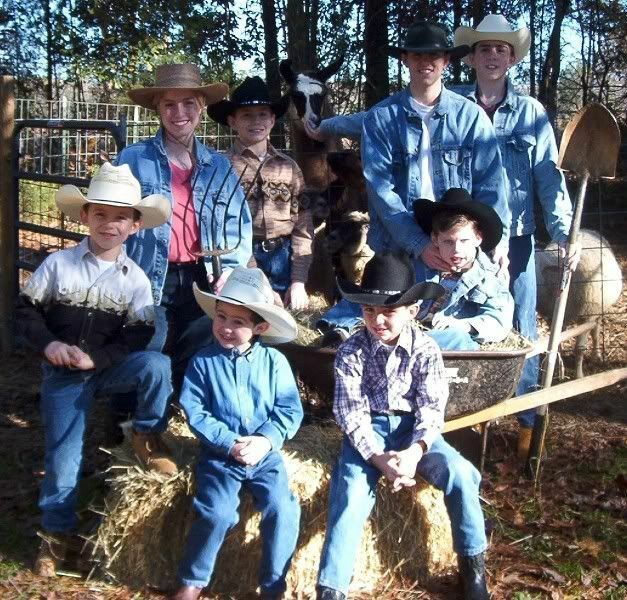 That left me and my six brothers here for the weekend. We had cereal for breakfast. It was supposed to be a treat because we have not had it in years because Sarah Grace learned from her whole foods nutritional studies that even whole grain cereals aren't good for you because of the way they are processed. We thought we missed it, but it was tasteless and unsatisfying and a total waste of money. We usually have our free range eggs, bacon or sausage, grits, and whole wheat biscuits, or we have blueberry or blackberry whole wheat pancakes, or Sarah makes a whole grain dish which she soaks overnight, to make it healthier. Her baked oat dish is so delicious with coconut oil and raisins and/or apples. It bakes up sort of like a cobbler or crumble and you put cream on it. Whole grain food tastes so much better since Sarah Grace started grinding our grains herself. They are much tastier than whole grain food you buy in the store, and they are healthier because grains lose all their enzymes within a week after being ground into flour. Enzymes are good for you. We thought it would be hard to change to whole foods but Sarah Grace worked very hard experimenting to find tasty dishes. She has studied traditional whole food recipes from around the entire world and even ancient techniques. She learned some things about healthy food from the Bible. Thankfully, Mom and Sarah Grace made breakfast today, and we noticeably ate more than usual. We got hungry! Fortunately, we weren't going to starve to death since Sarah Grace left suppers and chicken salad for us in the refrigerator. The only good things we had, she made. Friday was Sarah Grace's birthday and she got a cake in Hartsville but we haven't celebrated her birthday here yet. She wrote about her trip on www.milkandhoneyacres.com. I wrote a tribute to her here when she turned 18 that I don't think I can top, but I do have some things I'd like to say. I would like to find a wife just like Sarah Grace. She is gorgeous inside and out, and I love her very much. She likes nice things, but she doesn't have to own them. She can admire it at the store and then leave it behind gladly. She has beautiful clothing but not a lot, nor a lot of shoes. She doesn't want a lot! She enjoys simple things like when Vito Corleone presented his wife with that blemish-free pear, and she rejoiced over it. While they were in Hartsville, they went to a discount fabric store because they were excited to get fabric to help us boys to make shorts for the summer, and she had fun, and she was excited to help us. She didn't get anything for herself. I love how Sarah Grace keeps herself healthy and everything is perfect. She always keeps herself up and she is going to be a great momma. In the afternoon she takes a walk, but she is so caring that she takes Webb with her. Webb is in a wheelchair but she pushes him around so he can see some of the animals and flowers and get some fresh air and sunshine. He really missed her when she was gone because when she got home he squeezed her neck tight. And there is just something about her smile and laugh. It lights up the room and your heart! After waiting two years, the Hartsville High graduating class of 1947 finally had another high school reunion (they skipped a year). For the last five years I have escorted my grandmother. After the first one, I completely fell in love with her classmates and have looked forward to being with them every chance I get. This year, due to Ma's weakened health, my parents also came to help with the logistics, i.e. the wheelchair and oxygen machine. I couldn't wait to introduce them to Ma's friends whom they had not yet met, but are so very dear to me. On Friday night, my birthday, the group had dinner at Mr. B's, a local seafood restaurant. Ma surprised me with a lovely flowered pink and spring green birthday cake, and the class sang Happy Birthday. Someone yelled out "speech!" and I thought, "I'm a homeschooler, we don't do speeches!" I said something brilliant like, "I've been waiting two years to finally be here again. I'm so glad to see you all." To tell you the truth, there is no place else I'd rather celebrate my birthday. I've often pondered why I'm so drawn to that group of people, and perhaps that generation as a whole. The most remarkable thing is their sense of decency and honor. For the most part, the men are noblemen, which is something I long to see in men from my generation. At the risk of sounding sour, I can hardly even call contemporary males men, and certainly not gentlemen. They lack maturity and sobriety and they are entertaining themselves to death, literally. I'm not suggesting all the men in her class have received the new birth, but there's a certain standard of manners and chivalry that I greatly admire. The women of her class are lady-like and fine. I marvel at how they are content to be women and aren't trying to promote themselves. They walk in a timeless grace of manner that I hope to emulate. I guess some would say that WWII shaped that culture, and perhaps it did, in that it awakened and instilled a shameless defense of traditional American values which included Jesus, church, family, and the golden rule. What I would give! On Saturday, we went to Florence, SC to have lunch and pick up barbecue from Cain's to take home. On the way back to Hartsville, we stopped by to visit Anne Owings, my grandmother's close friend. We all but begged her to attend the reunion at the country club, offering to pick her up and take her home, or to our hotel if she preferred. We were disappointed she didn't feel up to it, but we had a nice, although much too brief, visit on her screen porch. When we arrived at the country club, I was glad to see a number of people we missed at Mr. B's. For the most part, the class looked healthy and I was delighted to hug their necks again. Now begins the wait for the next one. My brother James made a bow and arrow and it shoots very far away. And a chariot that he made? It very cool. I crawled in lycra that my family was holding up and I go in it and it was very deep. I have a little land made out of toys like little animals and trees and I made houses out of blocks. I made my little land behind the sofa because mostly no one ever goes there and I can be alone. And I also have people and cars in my little land that I made. And I got a new pair of shoes. And I got some new work boots because my other ones didn't fit me and there is a rip in them. Today we played football and tackle-loco. Will and Spencer played with us. And something funny happened. John throwed the ball over him head and George caught it but Will put his hand around he head and then Will caught it. You do not want to see Lady Ga Ga.
James is a good builder. I'm beating Dad in post writing! On the way to the dump to take a trailer load of garbage with Dad, George, and Richard, we saw army convoys and the soldiers had guns like in 24 when they were at the warehouse with the canisters. At least I thought I saw them with assault weapons but just now Dad and Richard said they don't remember seeing guns. Maybe I imagined it because the convoy was as far as the eye could see, and we were in the middle, so I started to feel like I was a part of it and in the army myself! Maybe the guns were in my mind's eye. Once we got to the dump, Richard could only find one of his work gloves so he spent a lot of time searching the van for it and at one point I helped him but it wasn't to be found. Finally, Dad let him unload with one hand. When we got home, he found his glove in his boot! After we unloaded, Dad bought us each a cherry Dr. Pepper. It was delicious! I'd never had one before so that was exciting. While cleaning out the workshop we found some pictures of Dad when he was in the Boy Scouts and he had puffy blondish 70's hair and a weird looking grown-up watch. He said his hair turned that color because of the chlorine in the pool. His hair is very dark now. The chlorine explains the color but it doesn't explain the Bama bangs and hair that was so long it was starting to curl up a little on the ends. We had rabbit pot pie the other night and it got us to thinking that maybe we should breed meat rabbits as a hobby. We've had rabbits before and James and Spencer and I are interested in starting it up again. We could make hutches pretty easily. Rabbit tastes like chicken. No, really, it does. It wasn't gamy tasting at all. Neither was the duck I had at the Kennedy Center. I've been warned about a gamy taste but I've never noticed one. It's like chicken but with a slightly different spin on it. It is very good and tender. One of our meatless nights was split pea soup and quesadillas. It went together very well, believe it or not. The split pea soup has a great flavor because they sauteed the onion and garlic in bacon fat and then sprinkled a little bacon bits on top of the soup. It may sound like a weird combination but the quesadillas were in place of the bread or crackers you'd normally have with the soup. I really feel good about myself. We've been working hard on the garden and workshop and animal pens and I feel accomplished. Mom says that boys who work hard are better prepared to become men. Some boys only take out the trash or mow the lawn or only do the work or chores they like. Sometimes they grow up and get sicknesses or conditions or disorders because they are lazy and need an excuse to get out of becoming manly men. Today I cleaned out a goat pen and a chicken coop. You can see maggots and roaches and mice but you just keep on getting it in order and do what needs to be done to clean it up and eliminate the pests. Mom and Sarah Grace tell us what they need and we do it for them, pronto. Don't frustrate women by making them wait; be dependable. That way I already know how to face the hard things for my future wife and children. It's about facing your fears and doing your duty and becoming strong. I can assure you that my muscles have grown this spring and it wasn't from working out or playing sports. It was from hard, unpleasant, work! On Sunday, our rest day, I went fishing and caught one. We also did some target practice with our bows and arrows. It was a great day because we knew we had earned it and we are proud of the progress we've made. Life has its dramas and its pressures, such that at points it may seem unbearable, but through these things we have had one constant: you. Whatever crisis we have, or whatever Satan uses to try to thwart this family, you are the rock to which we constantly cling. No matter how rotten we were such to deserve a spanking, you were always standing ready to forgive, wipe our tears, and rub our smarting rumps. We lurve you like the dragonfly lurves your toe. The way you cook bacon with your fist on your hip like Superman, your repetitive machine gun kissing technique, your ability to read a book aloud so that we feel as if we're living it, your soft, incoherent humming while you work, the way you crinkle your nose when you play with Richard, your ability to hide the golden egg such that a year later we still can't find it, being able to painlessly remove splinters of any depth or size, us taking turns rubbing your poor, swollen feet while you chewed ice during your pregnancies, all of these are endearing memories that we will cherish forever. And you... you smell good. Any project we were working on or dream we wanted to pursue, you were always 100% supportive. It would be impossible to list the innumerable times you have sacrificed your own pleasure for our sakes, but one thing is certain... we are eternally grateful. You are our "Jolly Time," and you are our precious. Uncle Bob, our beloved llama, died late Sunday evening from injuries incurred from a tree falling in his pen around one o'clock Sunday morning. Ironically, we were camping out on the property for a test run with Webb when Mom and Sarah Grace were awakened by a crashing noise. Although they assumed it was a fallen tree somewhere on the property, it did not occur to them that the noise came from the vicinity of the animal pens. Early the next morning, while planting in the garden, Sarah Grace noticed the fallen tree across the fencing, and when she entered the pen she realized Uncle Bob was not getting up. He lived through the day while we treated him with anti-inflammatory injections and pain killers in hopes that he would survive. Unfortunately, it turned out to be a spinal injury for which there is no treatment. We want to sincerely thank Spencer for all the years of great care he gave to our "World's Worst Llama," as he called him. Spence daily fought Widget, our bratty and covetous Nubian goat, to keep her away from Bobby's food. All the while Uncle Bob would casually eat at his own aloof pace while watching Spencer spend himself for his dining pleasure. Our Uncle Bob was the recipient of much affection and the giver of none to us, just to the spring babies, but, oh, how he loved them! He spent his last day spitting on us like never before, to our amusement, while we tried to save his life. It never deterred us from our unrequited love for him. He was our Uncle Bob. Today is a big work day but I'm taking a break. 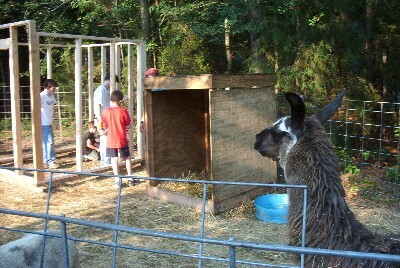 Uncle Bob, our llama, is a cool dude. He was bred to protect sheep and goats. Don't ask me how they do it, but he is born with a talent to take care of them. When we brought the sick lamb with the black polka dot and her momma up to the trailer in the carport, I thought Uncle Bob was going to jump the fence. He darted back and forth and back and forth along the fence with his neck stretched out trying to see them. Normally he runs like Pepe Le Pew with a boingy boingy hop but when he was worried, he sped very fast like Dash in "The Incredibles." We were just taking them to a safe place together to nurse the lamb since she was dying and we were trying to save her but Uncle Bob didn't understand that. He cried and fretted for them. He acted like they were married. When a liitle lamb was born last week, Uncle Bob stood up very straight in front of the momma to block our view. 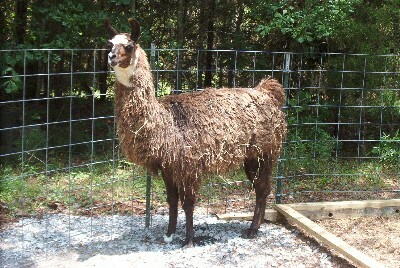 Mrs. Maury said when a wild dog got in her pasture, her llama pinned it down and gutted it. I know Uncle Bob would do the same thing if the girls were in danger. When baby lambs are born, Uncle Bob goes over and keeps watch. He sniffs them and nudges them to stand up and go to momma. He circles them to keep them from wandering away. He also gently lifts their legs to get them going. He is a very good nanna. He lets the babies climb on his back and topple off and climb up and topple off over and over again. I started calling Uncle Bob "Lieutenant Bob" since the new babies got here and I salute him. I call Crumpet, our castrated ram "2nd Lieutenant" because he's tender with the babies too. He lets them take naps with him. Hey Everybody! It's me, John, again! That's right, it's me again! Whenever it's hot and we spray Uncle Bob with the hose, he jumps up and follows the spray of water around with a big smile on his face and his ears perk up. Here's a picture of Uncle Bob just standing there. Bobby needs a hairbrush. Also, here's a picture of us building his new shelter next to the one we made out of a straw bin. That was just in the meantime until we could build his new digs. I'm the one on my knees hammering.